Well, it's here at last. The end of summer. Some people like to celebrate the coming of fall. They do this on the ridiculously still summer like day of September first. To each their own right? I however, dread the coming of fall because it means the end of summer. To me summer represents all things beautiful - fireworks, lazy days by the pool, lots of hot sunshine, smores over the fire, picnics, BBQs, chasing fireflies and how about 2 MONTHS of VACATION!! I loathe the end of summer. But it always comes. Sooner for me than others. Somewhere around the middle of August I head back to my classroom for orientations, trainings, and getting my room ready for 16-18 kindergarten kiddos. Last year we decided to celebrate the end of summer by taking a little trip the weekend before I went back to school. This year I've decided it needs to be a tradition and we've decided to keep it going. Letting summer go out with a bang ya know? 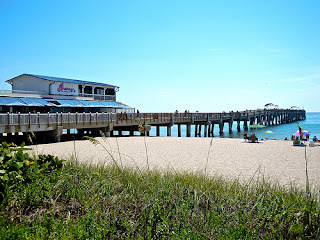 Last year we took a mini trip up to Titusville. Only about three hours away, we drove up one afternoon and checked into a cheap Best Western and then ordered a pizza for dinner. 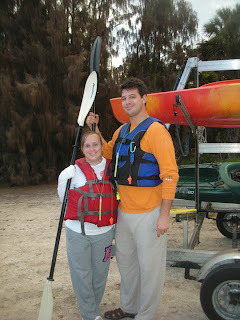 That night we went on a Bioluminescent Kayak tour with A Day Away Kayak Tours. It's quite possibly the coolest thing we've ever done. 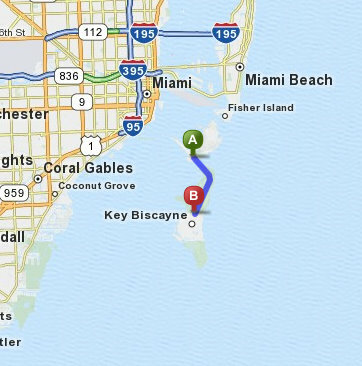 We paddled out into the Indian River and surrounding Harbors in complete darkness (it was a new moon). Every movement made the water glow. I mean, really GLOW. Bright green. 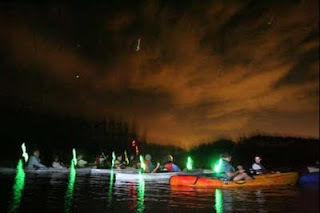 Every stroke made the paddle glow green. Dip in your hand - it glowed green. Every fish, manatee and dolphin that swam by was covered in glowing green water. 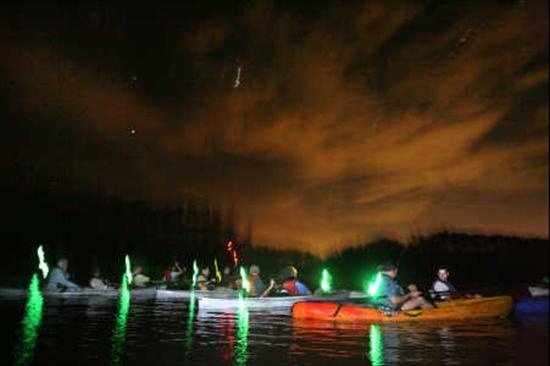 Just picture it - you're out in the middle of a river in pitch black, all of a sudden a green streak starts swimming towards you - faster, faster, till a fish emerges and jumps up over (or if you're not lucky into) your kayak. It was amazing and we would do it again in a heartbeat. This year we decided to stay a little closer to home. The day before I had to report back to work we started with breakfast in our home town at Benny's on the Beach. Amazing food. Amazing ocean view. Enough Said. I had the Tropical Stuffed French Toast - I highly recommend it. From there we headed down to Miami to the Seaquarium with our Adults pay Kid prices coupons in our hands. 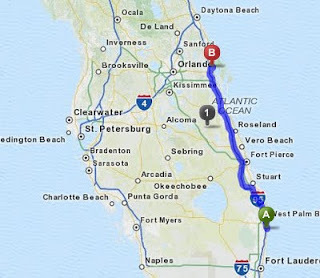 The trip took about an hour, so a little closer than last years trip. This girl, by the way, is crazy. Notice her ponytail? She apparently learned nothing from the trainer killed at Sea World last year when she was dragged under by her ponytail. Killer Whale Trick from Rachelle Rosenblit on Vimeo. Here's the grand finale (all 5 minutes of it) if you like dolphins and whales flipping. And little campers getting soaked. Dolphin and Whale Grand Finale from Rachelle Rosenblit on Vimeo. And we also saw lobsters, sea turtles, sharks, stingrays, alligators and manatees! And then chose to end our day back in our hometown at our favorite Greek place, Chris's Taverna. They mean it when they say best Gyro's in town. So there you have it. Our end of summer celebration. Bennys, the aquarium and some delicious Greek food. 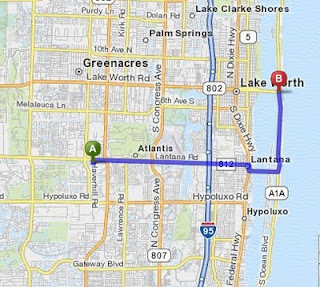 From Lake Worth to Miami and back. By the time you read this I will be back at work, dreaming of next summer!